With Ashkenazi and Sephardi-origin food starting to make its presence felt within London's trendy gastronomic scene, kosher wine is also undergoing a renaissance. However, my previous experience with kosher wine has, with one or two notable exceptions, been low on highlights. Pasteurised sweet red wine is probably the best known style globally and has not exactly raised its reputation but, as is often the case, stereotypes simply hide reality. I wanted to discover more of this niche sector and whether there really is quality across the board, so the 13thKosher Food & Wine Experience (KFWE) offered a welcome opportunity to do some research. Organised by Kedem Europe, this event showcased a selection of more than 200 wines from California, France, Italy, Israel, Spain, Argentina, Chile, New York and New Zealand. Additionally, spirits and liqueurs, including vodkas and fine Scotch whiskies were available on the day. Kosher catering was under strict orthodox supervision and, being a Jewish event, there was no shortage of food! Indeed, copious amounts of salmon, salt beef, white meat, salads and desserts (did I miss the potato latkes?) kept everyone well fed and there were even opportunities to attend cocktail masterclasses, as well as food and wine matching sessions. For wines to be labelled Kosher, once the grapes are picked and brought to be crushed, only strictly observant Jews can be involved in making and handling the wine. Not all Kosher wines are Mevushal - the pasteurisation process employed to render them suitable for sacramental purposes. This ritual was originally established to prevent wines that might have somehow been involved in pagan rituals from being unwittingly used. However, modern methods are very different to those of yesteryear and the most popular process today is 'flash pasteurisation'. This involves quickly heating the wine to around 85°C and then cooling it, thus reputedly having minimal impact on flavour, although there remains some confusion in the industry as to its knock-on effects. For example, one producer claims that making his wines Mevushal "locks in the flavour", thus improving it, while another told me that it makes no difference for the first two years, but only after that is the difference noticeable! Flash pasteurisation may have little effect on the sweet wines destined for sacramental use only, but I remain skeptical of the ability of dry wines to retain full aromatics and mature gracefully in bottle having undergone this process. Please prove me wrong if you disagree! Yatir Winery is a uniquely-sited vineyard in the Negev with desert on one side and forest on the other. Yaacov Ben Dor, the genial General Manager, is clearly proud of his wines and with good reason, as many have won awards and been recognised internationally by critics. 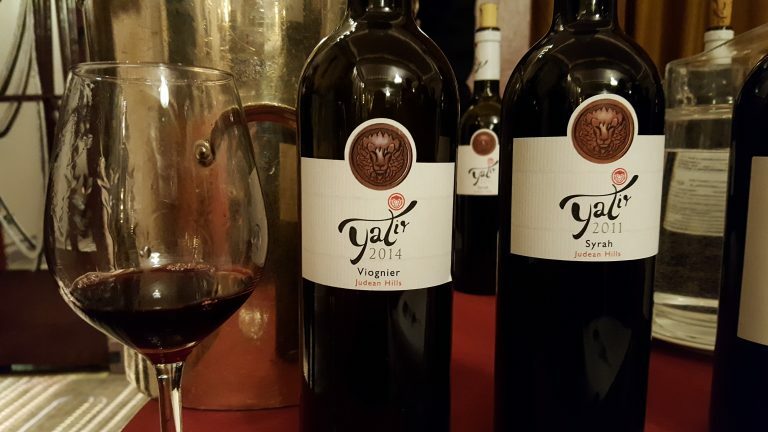 For example, Yatir Forest 2013 is his elegant and delicious flagship wine, made from Cabernet Sauvignon and Petit Verdot, while the only white is a fresh and fruity Viognier with that characteristic, but gentle aftertaste of peaches and apricots. If you like your wines big, juicy and concentrated, then look no further than the renowned Alexander Winery, a farming estate based in the Hefer Valley region of the Sharon plain in central Israel. The winery uses grapes from three specific vineyards located in the Upper Galilee wine region. Their premium, elegantly bottled Alexander the Great series, headed by the sublime Grand Reserve, shows off the winery's hallmark full-on fruit extraction style. 'Amarolo' is based on the famous Amarone wines of North-Eastern Italy, but uses French-origin grapes with a similar drying process to concentrate the flavours, resulting in a 16% powerhouse of ripe, rich, aromatic, juicy dark fruit and firm, yet velvety tannins. However, my star find from the show hails not from Israel but from California's celebrated Napa Valley, home to some of the United States' most famous wines. Hagafen Winery was founded in 1979 and Marketing Manager Michael Gelven told me that the winery attracts mostly non-Kosher customers! The reasons are clear, as the wines stand up for themselves in terms of quality, price and sheer deliciousness, my favourite being the delicately fruity, spicy and earthy Cabernet Franc 2011. White wine fans will not be disappointed either, the Chardonnay and Sauvignon Blanc both showing particularly well at this tasting, the latter having none of that overt gooseberry character often prevalent in New World Sauvignons. The kosher market is clearly very niche, so are there opportunities to attract a new audience? Hagafen is achieving this, but what about Israeli wine? The Judean Hills Quartet is not a four-piece choral ensemble or 1960s rock band, but a group of four wineries from the Judean Hills wine region located between the Mediterranean and Jerusalem. The 'Fab Four' (guitars not included!) recently came to London as part of a global drive to spread the word about the quality of wine from their region. Comprising independently-owned artisanal wineries with their own distinctive styles, the group has its origins firmly placed in history but with a modern, forward-thinking outlook. The Judean Hills was considered the "Bordeaux of ancient times" with wine made in low-lying limestone presses and stored in amphorae in cool caves before being exported around the world. Following the Israeli wine industry's revival in the late 19th century, it took around 100 years before Californian expertise kick-started a revolution in quality wine production within Israel. Plantings in higher altitude, cooler areas gained traction and so the Judean Hills region began to attract attention. Vineyards here tend to be small, between 400 and 800 metres above sea-level, backed by high mountains affording protection from the intense summer heat. A Mediterranean climate of dry summers with early morning mists and cool, wet winters plus well-draining, mineral-rich soils of 'terra rossa' red clay and limestone ensure the grapes ripen well, but retain acidity, freshness and (if the word can still be used) minerality. At present, there are 30 winemakers in this region, but only 10 are operating on a commercial basis. The quartet comprises two of the original pioneering wineries of the modern Judean Hills area. Domaine du Castel is owned by former restaurateur and founding father of the wine region's renaissance, Eli Ben Zaken, who planted his first vineyard in 1988 after falling in love with Puligny-Montrachet and whose wines attracted international recognition to the area in the 1990s. The winemaker for Tzora Vineyards, established by grape grower Ronnie James in 1993 with the aim of establishing a Judean Hills terroir, is Israel's California-trained first Master of Wine, Eran Pick MW. Flam, whose winemaker Golan Flam's passion for viticulture began in childhood when his father was a student at the University of California Davis viticulture & oenology program. Sphera, the only non-Kosher winery in the group, and the winemaker Doron Rav is committed to minimalistic intervention. Kedem Europe is the importer for Flam and Castell, while 32°-34° Wines, a new company based in London and named after Israel's latitudinal band, is the importer for Tzora and Sphera. The four winemakers, with Eran Pick MW at the helm, led a discussion and presentation on a selection of the group's wines and spoke about how the quartet came about, their objectives and hopes. "We were good friends anyway, so it was natural that the four of us came together", explained Pick. "We're confident in what we do, without personal egos or separate interests getting in the way! We want to tell the world about the quality of Judean Hills wines and we believe that one winery alone cannot succeed in telling the story and making the impact we want. Getting these wines known outside Israel will help all wineries in our region." Judean Hills wines typically have less colour, more finesse and do not show the super fruit concentration and power that some Israeli wines further north do. Other characteristic features including an elegant and gentle fruit profile with Mediterranean herbs and spices. West-to-east plantings, north-facing plots, use of nets, lack of de-leafing and judicious use of irrigation right up to harvest time are a variety of techniques used to help protect the grapes from higher levels of radiation and to preserve phenolics and aromatics. Most grapes planted are red (90%) with whites on the increase. Made from 55% Cabernet Sauvignon and 45% Syrah grown on a north-facing slope filled with fossils, the grapes were harvested early and had a short maceration of between 12 and 18 days, followed by 16 months oak aging (35% new). The result is an aromatic wine full of freshness and juicy fruit, touches of figs and dates plus gentle sweet spice and soft tannins. Syrah is one of the varieties the group believes shows great promise with a different profile from that grown in the rest of the country. Therefore, it was a real treat to try this gem from the lower lands of the Judean Hills, aged for 12 months in French oak, of which 25% was new. Beautifully elegant notes of forest fruits with soft pepper spice and a touch of chocolate in a wine that's over 10 years old! Eli Ben Zaken's wines are renowned for good reason and it was a delight to be treated to this wonderful example from 2008. A combination of red and black berry fruit, good balancing acidity and tannins, an earthy, savoury edge plus a saline touch make this wine one of the 'ab fab' stars of the tasting. The Judean Hills Quartet wants to spread the message that Israeli wine can be of very high quality and not just for the Kosher market. Judging by the reds and whites sampled at this tasting, there are many reasons to believe that their mission will be successful. Kosher wines, as a category, may ultimately attract a small section of the global wine-drinking population. However, wineries like Hagafen, Alexander and Yatir and collaborations like the The Judean Hills Quartet are proof that these wines can appeal to a much wider audience, so if you've never tried them before, give them a go. You may be very pleasantly surprised!